Folks are big mad at Cook County State’s Attorney Kim Foxx. I’m talking mad enough to protest outside of her downtown Chicago office, chanting things like “Foxx must go” and “Blue Lives Matter” while enlightening Black and Brown organizers on why Laquan McDonald deserved to be killed by police. Months ago, Foxx wouldn’t have guessed that she’d be under such scrutiny today. In January, many Chicagoans applauded her decision to hold a press conference asking anyone with information regarding new sexual allegations against singer R. Kelly to come forward. She was being proactive, keeping one of many promises she made as a reformer running against controversial Cook County State’s Attorney incumbent Anita Alvarez back in 2016. But public attention shifted on Jan. 29, when news broke that “Empire” actor Jussie Smollett was the victim of a racist and homophobic attack in Chicago’s Streeterville neighborhood. Anonymous tips, rumors, police updates and news headlines about Smollett’s attack took over the 24-hour news cycle and flooded every social media channel. 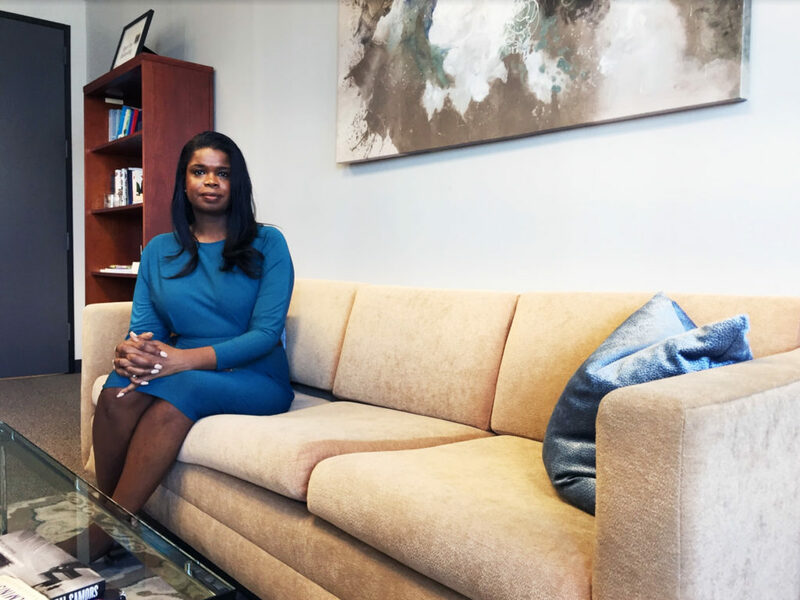 As an attorney for victims of crime, Foxx says, she got involved in Smollett’s case. “Someone reached out, having had concerns about the case, and wanted to put them in touch with me to relay those concerns to the Chicago Police Department,” Foxx told The TRiiBE. When Smollett’s status changed from victim to suspect, and police accused him of staging a fake attack, all hell broke loose. In February, Foxx recused herself from the case. And on March 26, the State’s Attorney Office dropped all criminal charges against Smollett. His record was wiped clean. The scrutiny and calls for Foxx’s resignation went into full gear. Mayor Rahm Emanuel called the dropped charges a “whitewash of justice.” The Fraternal Order of Police held a news conference, demanding that Foxx resigns from her office. Meanwhile, Foxx has received overwhelming support from Black leaders and writers in Chicago, including Rainbow PUSH, Lauren Washington from the Chicago Sun-Times and Dahleen Glanton from the Chicago Tribune. In our April 8 interview with Foxx, she wants to share her side of the story. Read our interview below. (This interview has been edited and condensed for clarity). It’s been a rough start to the year for Chicago, to say the least. We started off with R. Kelly and now we’re here with Jussie Smollett. Can you talk to me about the beginnings of the Jussie Smollett case? Kim Foxx: I should first say there is not much I can say about the evidence in this case because certainly, as we have said, we’re availing ourselves for people to look at how we made the decision in this case. [Ed. Note: Foxx made public internal texts and emails on the Jussie Smollett case]. I don’t want anything that I say to taint whatever that scrutiny looks like. So I feel like there’s little that I’m going to be able to say other than I saw [the case unfold] like everybody else saw it. You initially had some contact with his family and that’s what led to you recusing yourself from the case. Can you talk a little bit about that? KF: I think for a lot of people it’s surprising that someone can reach out to the state’s attorney about a case. I talk to victims and victims’ families with some frequency. Most notably, there’s a group of moms who have lost children to gun violence whose cases may be in various stages of investigation. They are frustrated that detectives aren’t calling them back. They’re frustrated that leads aren’t being run down. [They] will reach out to me and say, “Can you talk to the [police] superintendent, or can you talk to someone in cold case?” So I’ll have those conversations and plug them in with other people. I think it’s important for people to know that I am the attorney for victims of crime. So access to me is not just limited to people who have celebrity status. In fact, it is overwhelmingly used by people who don’t. A couple of weeks ago, I was at domestic violence court. We have meetings with advocates and stakeholders every quarter. As I was leaving, there was a woman who had trouble getting an order of protection and she was telling me about it. We walked her down to help walk her through the process. I think that’s the role. That’s my job. If I can’t point you in the [right] direction or hear your concerns or pass them on, then I think I’m not fully availing myself to my responsibilities. So in [Smollett’s] case, someone reached out, having had concerns about the case, and wanted to put them in touch with me to relay those concerns to the Chicago Police Department. So when the contact was first initiated, he was still a victim? What makes this situation stand out? With the latest R. Kelly allegations, you made yourself available to victims as well. You gave out your number at a press conference. How did we go from that being applauded to similar actions being frowned upon in Smollett’s case? KF: It’s a good question. Most people, who don’t understand how the process works, watched this [“Surviving R. Kelly”] documentary and was like, “Why hasn’t he been charged? What is happening? What are you going to do about that?” And I think for us, we viewed that initial press conference as an educational opportunity. Cases don’t just appear. You need victims. You need witnesses. If you know or [have] seen or have heard something, you have to call us. I recognize that is really hard. When you talk about distrust of the justice system, it’s across the board. So that act was about opening the doors. This is our job. I am your prosecutor. In [Smollett’s] case, it’s the same thing. I think the difference is you had someone who went from being identified publicly as a victim to being identified as a suspect in a crime within two weeks. I think for the shift in people’s minds, they saw the end result. “He was accused of having done something, how could you talk to them two weeks earlier?” I think there’s a conflation of the two: victim and suspect. I think we have to remind people that there was a period in those first couple days that, even on the day that I had the contact with the family members, [Chicago Police] Supt. Eddie Johnson was on television reaffirming that [Smollett] was a victim. The moment that it had become clear in my mind that the investigation was starting to turn, it was not appropriate for me to continue to have that contact. In speaking with my ethics advisor, we talked about the best route, and that was for me to recuse myself from the case. Can you walk us through Smollett becoming a suspect? What is the protocol in that situation? What happens next in the process? KF: So what we have to understand is, at the point that I recuse myself, whatever you might be hearing on TV or [on social media], there’s an investigation that’s happening. For me, it was not only just not talking to relatives. I didn’t want the appearance. There was no actual conflict. I didn’t want for the relative that I talked to, to say, “Holy smokes. Are you using what I said to you against my brother, or cousin or nephew?” At the same time, whatever happens with the investigation, you don’t want the decision to be thought of as, “Oh, it’s because you had this conversation.” So for me, it was no communications whatsoever about this case with anyone in our office who is working on this case. The work on the ground of identifying who the two people were in the video, and where did the two people live, and how can they track them down, then tracking them down, then having them arrested, all of that is still happening while I’m walled off from the case. The information I got is the same information that people are getting through television. How is it that this case became such a public interest? I’ve seen you on national TV talking about it. I’ve seen Mayor Rahm Emanuel and Supt. Johnson on TV upset about it. Why is there so much interest in this case? KF: I think [it was] the allegations that someone would attack this gay, Black man for being a gay, Black man in a way that they did, and that the impact on actual victims of hate crimes. I’ve sat with actual Black trans women and men who have described to me the things that they have endured both with the system and in their own attacks, and it’s atrocious. You’re talking about communities that feel marginalized already. I think, for some, the allegations that [Smollett] did this minimizes people who are actually being traumatized by these types of acts. Then I think there’s kind of the spectacle of, “who does that? This guy’s on TV.” I think people were intrigued and I think at the end of the case, it was an abrupt ending to something that was already strange. I think [it] just added to the fervor. Can you talk about your office dropping the charges against Smollett? With your recusal, is that something that comes from you? How does that process work? KF: Most Class 4 felonies don’t come up to me for approval of what we do with the case. But [Smollett] is a public case. It’s got interest. So I might have known about it in a regular scenario. But in this particular case, because I am recused, I’m not part of the decision-making process. I’m not part of the negotiations. I’m not part of any of that. I am told the night before they are going to court [about] what’s going to happen, and that’s just for information purposes. I don’t have the authority at this point because I’m off [the case]. I’m not involved in the court date. I’m not involved in the informing of folks. In Smollett’s case, who made that decision? KF: It was our first assistant, my number two, in consultation with the lawyers who are working on the case. The charges against Smollett were dropped, but that doesn’t mean he was exonerated. Can you talk about that in detail? I think a lot of people view that situation as Smollett walking away unscathed. KF: I won’t get into the evidence of it, but at the end of the day, Mr. Smollett forfeited his bond, which was $10,000. I think deferred prosecution is something that most people don’t know is available in Cook County. I would hope that the silver lining in this is for people who find themselves in our criminal justice system with Class 4 felonies [is] recognizing that we don’t always have to resolve things using jails and traditional prosecuting methods. Under deferred prosecution, certain offenses, including a disorderly, can have a deferred prosecution. What that means is rather than plead guilty, if you meet certain conditions, your case can be dismissed, even without a plea of guilt. The conditions can be restitution. Under the statute, the maximum amount for restitution is $10,000. Also under the statute, if you’re not in jail, the mandatory conditions that you would have is community service. So I think for some folks, not admitting guilt or having a guilty plea feels like there’s no accountability. When you look at it, having to forfeit that $10,000 bond and do community service is what’s required under the statute. Criminal justice reform was a big part of your campaign when you were running for office. Can you talk about how you’re reimagining the criminal justice system here in Cook County? KF: The painful conversations that we’ve had is the ability to say “what do we want to do with people who commit nonviolent acts?” Chicago has a violence issue. We have 33 people who were shot over one weekend. We take more guns off the street than New York and Los Angeles combined. We are literally losing a generation of young people to gun violence, and our responses have to be thoughtful around the drivers of violence. What can we do around violence prevention? How do we make sure that people who are a danger are separated? When you have a place like Cook County, which is so big, and you believe that the way we’re going to deal with violence by treating people who do dumb things but aren’t dangerous in the same way that we treat [violent offenders], we’re going to miss it. I want to use my resources to go after violent crime. And I want for us to not use our resources for non-violent offenses that can be dealt with outside of the justice system. So criminal justice reform, for me, means being able to distinguish the two. When I talk about prevention, people shouldn’t get a felony conviction just ‘cause they annoy us. Once you get a felony, your ability to get a job, your ability to get housing, your ability to integrate back into society is diminished. What we find in areas that have the highest concentration of violence [is] high unemployment. We have large pockets of people who have come out of the justice system living in the same zip codes. What happens in this one [Smollett] case is actually not an anomaly. A lot of people with a Class 4 felony, with no criminal background, should be able to have their cases disposed of with some alternative prosecution — not because you have money, but especially because you don’t. There was a lot of conversation on social media about Smollett being indicted on 16 felony counts for allegedly filing a false police report. His jail time could have been more than former police officer Jason Van Dyke, who was convicted of murdering Laquan McDonald. Is this a conversation about race? KF: I think people are rightfully asking questions about how we do our work. Unless you know someone personally who’s in the system, you either know this stuff from “Law and Order” or “The Wire.” You know what I mean? Again, I wasn’t involved in the charging of the case. I’m out while the case is still being investigated. Sixteen counts is a lot of counts. And the question that people are asking is, “why so many? Is that right? Why the same amount as someone who shoots a police officer? Is that fair? What does justice look like? Are there disparities?” One of the things that we do, that I’m most proud of, is that we put all of our data on an open data portal — every case that we’ve filed, every case that we’ve rejected and every disposition. We have it identified by gender and by race. You can go and look and see how we are treating people who have Class 4 felonies based on their race. We can start answering those questions. I think there has been this historical disparity within our criminal justice system around race, around sentencing, but you can’t fix what you can’t measure. You can’t just have the Twitter anecdote. You need to be able to look at the data. Policing strategies are different in different parts of the city. If you’re more likely to get charged because you’ve been arrested four times, that might be an issue of zip codes. How do we fix that? I think, for us, the conversation around race is always present because I don’t think you want to run a criminal justice system, or run a prosecutor’s office, that doesn’t take it into account and has disparate treatment for different groups. How are you handling the criticism? Emanuel and Johnson called you out on national TV. Former Cook County State’s Attorney Anita Alvarez criticized you on Facebook. President Donald Trump even chimed in. KF: I signed up for the job. I think while the decision [to drop the charges against Smollett] wasn’t mine, leadership requires that you accept responsibility. You accept the criticisms as they come. You accept the scrutiny as it comes. It can be difficult to hear the things that people are saying — particularly without context, particularly when you have half a story, particularly when it is driven by social media instead of facts. I’m a fact-based person. I tell my folks all the time, facts not feelings. So there’s a frustration sometimes that I have. If we can have an honest conversation about the facts, maybe you’ll see things differently. [As for] the mayor and superintendent, I think there’s a certain level of professionalism that you always have to have. As elected leaders, and leaders in this city, we will disagree. We will absolutely disagree, but I think that we owe it to the public to handle our disagreements in a way that’s respectful. These last two weeks, for me, have been a real lesson in leadership and humility. Again, I’m so proud of the people who work here and the work that they do. The shroud that we’re under right now is disappointing, but the question becomes how do you move forward. What are some things that you’re taking away from this case? From social media? From the responses of other leadership in the city? KF: I don’t know that we can prevent something wild like this from happening again, but I think some of the takeaways are being able to talk to our partners in a way where they feel like they’ve been heard, even if they don’t agree with me. Recognizing that a lot of this was people feeling uninformed and what that then means for them and how they respond. It also has meant when we make big decisions, [we] make sure that we are able to explain ourselves on the front end. I think we did a lot of explaining after the fact. Trying to fix misinformation is really hard to do. And I think it has also meant for us to be more engaged and proactive. People know about us prosecuting people with guns and [who] murder, but people don’t know about what we do on our alternative prosecutions. I think [we need to] find ways for us to talk more about that. I think recognizing that you shouldn’t take for granted that people understand what you do, and it’s not their fault. The onus is always on me to make sure that people understand. You don’t have to agree, but my job is to make sure that you understand. Is Chicago ready to have a real conversation about criminal justice reform? KF: That’s my question. That is my honest question. I think we have to reconcile with that even people who make us mad — who are rich and privileged — shouldn’t be denied the same access to justice as someone who is impoverished. We have to take that emotional piece out and say what is in the interest of justice. And that’s sometimes hard. At the end of the day, I will stand firm in the belief that we’ve got to deal with violent crime in this city and we have to deal with it in a thoughtful, strategic, holistic way, and justice reform is a part of that. Justice reform insures that we have public safety, but we have to have a real conversation about what people are willing to give for that. Ideally, what does criminal justice reform look like to you? How do all of the partners play a role in the criminal justice reform that you see? KF: I think on the county level, myself, the Cook County Public Defender’s Office, the Office of the Chief Judge and [other] criminal justice stakeholders have been working on these issues collaboratively for years. So, it’s not just me. The work that we have been doing in bail reform, the fact that we’ve seen a 35-percent reduction at the Cook County Jail, that’s been a collaborative effort with the stakeholders. I think there’s been a lot of really good work around justice reform and alternatives to bringing people with mental health issues or drug addiction into the jails. There’s a lot of work that’s happening on the ground that I think most people don’t pay attention to unless [they’re] directly involved. Sometimes outcomes aren’t going to be what we want them to be, but it doesn’t mean that you derail the whole effort. I think we’re going to be OK. And I think if Mayor-elect Lori Lightfoot and Supt. Johnson, who I talk to on a fairly regular basis, know that it’s in the interest of Cook County that we have a justice system that people have faith in its credibility and its legitimacy. We don’t do us any favors by not promoting that together. What would you want to say to Black folks who have been watching [Smollett’s] case and seeing this attention on your office? KF: I would say that criminal justice is complicated. In the last two months, we have had two high-profile cases that both are reflective of what we see every day. I would certainly want for people to look beyond the headlines. How do we do on those [everyday] cases? With the Smollett case, here’s one guy who did something. What is the answer for how he should be punished? How do we treat people who do things like this? The celebrity piece is interesting and it’s exciting, but it is reflective of less than half a percent of the cases that we have. We have the largest single-site jail in the country in Cook County. We have 35,000 cases that come through. I would hope that people would want to know more about the non-celebrities. Are we fair? Are we just? At the end of the day, accountability to me is, “you said you weren’t going to treat nonviolent offenders in the same way that you were going to treat violence. You said that you were going to divert.” Let’s have that conversation. I feel good about that conversation all day.